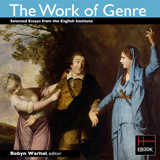 HEB is pleased to announce the release of our latest XML title, The Work of Genre, edited by Robyn Warhol and published by The English Institute in collaboration with ACLS. This represents the second born-digital installment in the English Institute's ongoing series of publications derived from its annual conferences and comprises selected papers from the 2009 conference held at Harvard University. (For more information the launch of this digital series and its initial installment, On Periodization, please see the following link.) This volume features seven essays, in addition to the editor's introduction, exploring questions such as: How do genres come into being, and what distinguishes them one from another? What do considerations of genre occlude, as well as reveal? What kinds of generic categories might be useful for critical analysis today? HEB will continue to offer further installments of this series, edited by Meredith L. McGill of Rutgers University, on an annual basis.